Better Finance, Inc. is a financial technology company providing innovative leasing and credit solutions to consumers and small businesses online, in-store and via mobile. 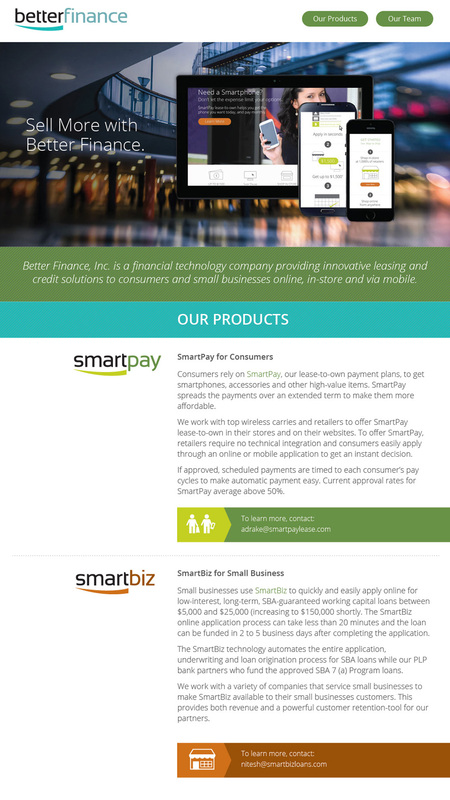 Their products include SmartPay for consumers and SmartBiz for small businesses. Better Finance is backed by leading venture capital firms including Investor Growth Capital, Venrock, First Round Capital,Baseline Ventures and SoftTech VC. Better Finance underwent a rebranding in 2014, dropping the old name of BillFloat and narrowing its offerings to focus on just a couple of well-defined products. This simplification required a new, approachable website that could serve as a springboard to explain their products, team, and philosophy to investors, customers and business partners alike. The single-page design leverages oversize photos and highly readable fonts, creating an atmosphere of ease and credibility without being too technical.